MCV EMT Team #2 arrives! 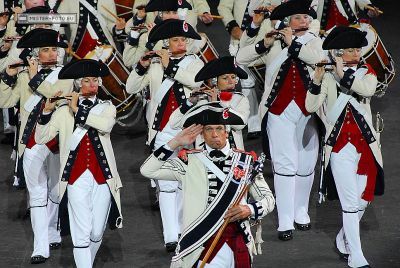 MCV Fifes & Drums > Blogs > Live...from the Edinburgh Military Tattoo > MCV EMT Team #2 arrives! Our first half team finished up with two bang up performances this past Saturday and those of us here for the duration were very sad to see them go. Team #2 arrived on Saturday and were thrown in to their first public performance on Sunday at the Mini-Tattoo held in Aberfeldy. Last night was Team #2’s first EMT show and everything went off swimmingly; the mecurial Scottish weather even cleared in time for the performance. We hope to have additional video clips up by the end of this week. Elsewhere in Edinburgh: both the International and Fringe Festivals are in full swing and city is jammed with performers from every part of the world. EMT Photos: our MCV photographer Matt Lug has begun to post photos from the trip, these can be seen on the MCV Photo Album as they become available. Days 1-3 are now posted, including our performance for the Lord Provost of Edinburgh. Congratulations to everyone in MCV! Your performances have been terrific! We managed to catch you performing in Glasgow on Tuesday, 8/7, at Ross Pavilion and at the Tattoo on Thursday, 8/9. We will admit to being just a little prejudiced, but others in our group thought the show was “fantastic!” All your rehearsals and hard work have certainly been paying off. When one lone fife echoes around the castle, little shivers run down your spine. Keep the edge; you make us proud! have been looking forward to making the trip over to scotland since the time i heard you were confirmed for the gig. made it to the sat 18th 10.30pm show, and although it was very wet it was worth every minute of it. the drum corps and flute corps were par excellence. a real pleasure to watch.